Church Overlooking the Sea, by Mike Jackobo. 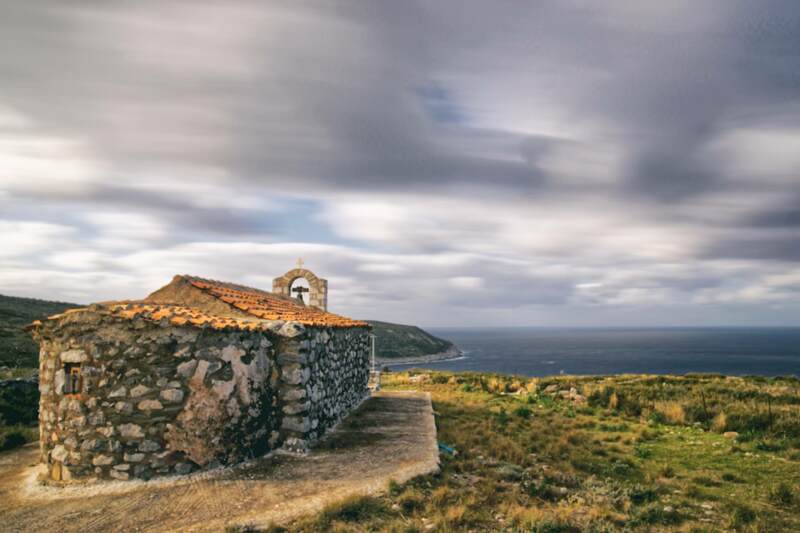 A long exposure photo of a small church overlooking the sea. The church is dedicated to St Anna and it is located at the western part of Mani Peninsula. More specifically the location is in hte middle of nowhere, south of Diros. The rough terrain of Mani has very few and scarce settlements that seem more like fortified positions than traditional, idyllic villages. Hence the term “in the middle of nowhere”. There is no notable settlement around this location. As I was driving on the road that roughly follows the west coastline of the peninsula, I saw this church near the coast. It really stood out against the barren landscape. I began looking for a road that could take me near the church. Somehow, someone had to get down there; there had to be a road somewhere! At that moment, I was looking for another location that I was familiar with, from a previous visit. The road I was looking for, the one for the church, was just on the spot where my original target was. It was a poorly maintained and narrow country road. In fact, it was bad, that there were patches were the tarmac was now a dirt road. It seemed more like a paved trail than an actual road. Slowly, I began driving down the trail. After a few minutes, I reached the church yard. After checking the interior of the church and the surrounding area, I took out my gear. Then another problem became apparent. Wind! In order to make the photo, I had to extend the tripod to its highest position and that was about two meters high. A tripod fully extended is also unstable. The wind was strong that I could see the tripod with the camera on top shaking more than what was acceptable. The wind was not going to calm so I had to make the photo and just hope for the best results. I made three attempts in order to increase the chances of making an acceptable photo. This one was the last one of the batch. I didn’t choose it because the low shaking but because the sun broke from the clouds, giving an excellent lighting in the photo. So, I left with the photo of the church overlooking the sea in my camera. But I am not finished with it; someday I will return.